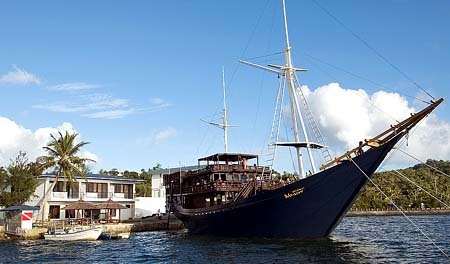 Diving luminary Bill Gleason has just returned from a visit to Manta Ray Bay Resort, Yap, Micronesia. When I heard Bill was going, I asked if he would write a report for the Island Dreamer. Following is Bill Gleason's in-depth update on the travel to Micronesia, Manta Ray Bay Resort, the surprising diversity of Yap's diving, and its famous manta rays. Hartford, CT to YAP -- It's a bit of a haul from the east coast of the USA, but overall not a bad trip courtesy of Continental Airlines and Air Micronesia. The Houston/Guam/Yap flight went off absolutely full, and still without a hitch. There's just enough time to stretch ones legs in Honolulu and Guam, and suddenly you're in Yap. So that's a positive. The negative was getting back and forth to Houston because of flights being full. So I did a quick overnight on the way down (La Quinta) and a day room for 6 hours or so at the Marriott on my return. The interesting thing here is that despite several long (8-12 hour Houston layovers) Continental did check my luggage all the way through on both outbound and return. That was a big plus as I always have a change of clothes and toiletries in my carry on, and didn't have to lug my heavy bags around for these short overnights. Manta Ray Bay Resort -- All of the improvements at the hotel will soon be completed. That includes upgrading to 34 rooms, a brand new spacious lobby area, an "infinity" swimming pool with stone/tile manta rays on the bottom, and a quiet waterfall on the side. The rooms are very impressive in size. I would describe the lodging as luxury (great beds and decorative stuff, etc.) and the service as first class. Very clean, etc. That said, this is a diving hotel, not a Hyatt. And while it is on the water, it is not on a beach. But I can't imagine any diver being disappointed with their accommodations at Manta Ray Bay Resort. Yap Divers -- This newly renovated Dive Shop and service facility is exactly what a discerning diver would want and expect in a true dedicated dive resort. There is excellent storage for guests' dive gear, including camera tables as you enter the dive facility. Sign up boards, great briefings, and the dive manager, Jan, is nearly always in the store or out on the dock, explaining dives, making sure people understand the next day's plan, etc. The dive boats are small and fast. It's only usually 15-minutes to any of the dive sites, not the 1.5 hour day boats of Palau. Due to the channels which crisscross the island, you can also get to the lee side in any reasonable diving weather and find yet more interesting dive sites. Healthy Reefs -- Yap did have a storm last year, and I expected to see more damage than was evident. On a couple of dive sites, very, very, shallow (10 feet or so) you can see some storm effects. The walls are not damaged at all, only the shallows, and only in a few places. Interestingly, I didn't see much algae even in the damaged areas, indicating water quality is fine enough to continue to provide an excellent media for coral (not algae) growth. The walls are steep and deep, and the blue water brought back memories of the South Pacific from years ago. There is surprising diversity to the diving, more than I expected, with walls and reefs, some very good cavern dives, and a drift dive similar to Blue Corner in Palau, though with not as many sharks. In short, 32 different sites around the island of Yap offer a very satisfying amount of diving diversity. Critter Diving -- And that's before the "critter" dives. I saw Mandarin Fish, Leaf Fish, Ghost Pipefish, and many other unique creatures, and without really trying as I was shooting wide-angle. I did do a special Mandarin Fish Dusk dive, and it was probably the best one I've ever done. The fish are out of their holes, the males are fighting, and mating with the females, just about every night! Now, I've seen this behavior before, but not with this level of frequency. The point her is that Yap has some great stuff in addition to the manta rays. 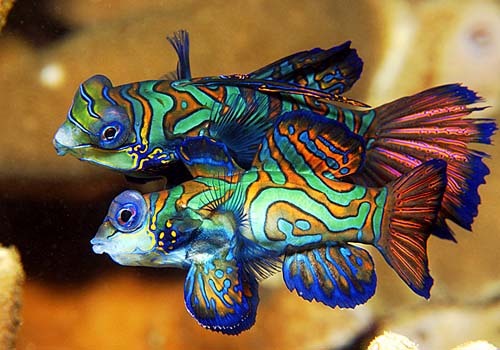 Perhaps not the range of what you see in Indonesia, but I'd put the Mandarin Fish dive up against anything I've seen there or in Papua New Guinea. 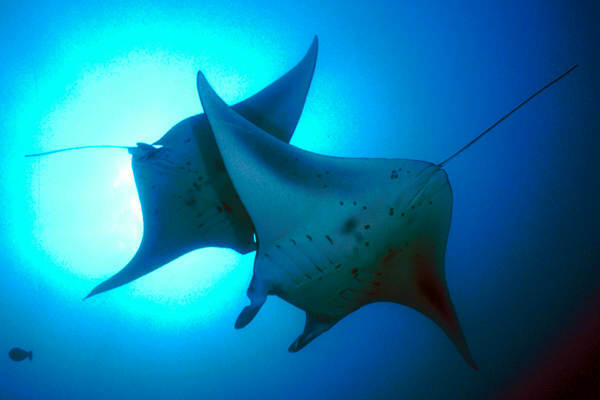 The Manta Rays of Yap -- Guaranteed mantas pretty much says it all. The manta dives were immensely enjoyable. The mantas are a tad smaller than the giant ones at Socorro, but still very impressive. I dove several times on an outgoing tide (greenish water), once when we got skunked at the manta station, and then again at the end of my stay with blue water and four mantas at once on the cleaning station. Guess which one I liked the most. Again, a good reason to stay a week. Why go halfway around the world for manta action and dive with them in green water? Stay for at least seven days and you will dive with mantas in blue water. Manta Visions Photo Pro -- Photo service operator Mike Veitch is an excellent shooter, as well as a very pleasant and capable guy. Mike is fully up to speed on both digital and film photography. There is no E-6 processing, but that is quickly becoming a non-issue. Mike is also a good critter guy, wide-angle shooter, and an insightful teacher. Underwater video service are also offered. New Mnuw Restaurant -- Ken, you certainly remember the very funky combination that was Sipadan Island in the early days. The huts, the drop off, the cold beers in the big hut at the end of the day... there was just a certain special feeling to the trip. 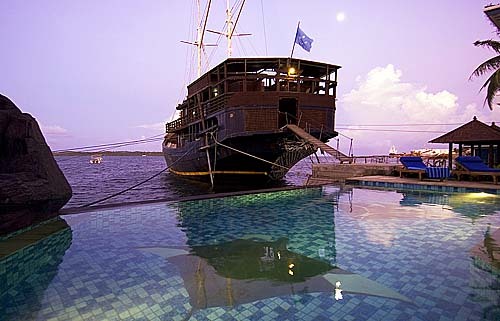 Manta Ray Bay Resort has added its own unique ambiance with the Mnuw Restaurant based on its own 120-foot long ship. This South Seas Schooner serves as the resort's bar, and provides a casual, fine dining experience that really adds a dramatic element to the vacation here. It somehow contributes to that great feeling of once again being "out there" on the "edge of diving civilization." The roomy top deck is the "Crows Nest Bar," and there's no finer place to imbibe a bit in the open air overlooking the sea. The deck below that is an inside bar with casual dining, as well as full menu dining, but no air-conditioning. Below that is a large, air conditioned dining room. Guests seem to prefer the Crows Nest and the non-a/c areas. Go figure. Dining for Divers -- Overall, the food was good to excellent. Breakfast excellent, lunch excellent. Everything from full breakfast to good sandwiches, soups, and full meals for lunch. Also reasonable prices. So they're not nailing the people once they get them there. Breakfast cost under $ 10. Lunch could go anywhere from around $ 8-15, and dinner was not much more than that (certainly under $25 per person). All meals provided generous portions. A sandwich at lunch came with both a small salad and onion rings. Dinner was also quite good, but I'd be lying if I didn't say I spent more time up at the Crow's Nest. Adding to the fun, a microbrewery will be on line soon at the resort, serving up some exotic hops concoctions. Bar prices were reasonable, although I may have gotten a volume discount! Island Culture -- Micronesia is home to a variety of intriguing indigenous cultures. On Yap, I did two different island tours just to make sure I had it right. The tours were well run, you walked if you wanted to, and the van was there if you didn't. Yap's famous stone money is truly unique, and well illustrated in the "Stone Money Banks" you visit in the villages. A couple of guests commented on the "lack of people," despite the 128 villages known on Yap (population approximately 10,000 people). If you do the math, that comes out to only 78 people per village, so if you're expecting a general store or gas station, forget it. In Yap, "village" describes a place where people live, not on top of each other, but reasonably spread out. The local meeting houses are an experience, and the "men's house" helps one to better understand the culture, which is fascinating. The dancing cultural tours are a different story. Here, the local people come through vibrantly and enthusiastically. (This ain't no Hawaian luau!) To gain at least a basic understanding of Yap, I recommend that one do both tours. They are not all that expensive, and need not cut into diving time. Resort Staff -- This staff has it down. They know your name when they pick you up at the airport, they know who you are in the restaurant, the dive shop, and everywhere else on the resort. I can't think of a better recommendation for the level of service they have there than that. And that's from the perspective of a fellow traveler from Germany who said, simply, "Even if they can't pronounce my name (Dyrk, a tricky one), they remember my room number, that I like coffee in the morning, not tea, but tea in the afternoon after the dive, then Budweiser... "
Yap has more than enough diving experiences, and dive sites, to be considered a top notch, stand-alone dive destination. I recommend visitors consider a seven to ten-day stay. A visit to Yap can also be the lead part of a very satisfying, multi-island Micronesian adventure. 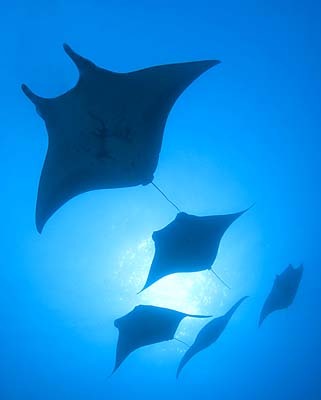 Yap's manta rays have been both a blessing and a curse, for they may have obscured the rest of Yap's diving diversity. The guaranteed opportunity to swim with the manta rays is an exceptional experience, one not to be missed. But Yap's other diving is so equally fine, that's what would make me pay to return, and bring a group with me. With all renovations completed, Manta Ray Bay Resort is expected to be "camera" ready on about September 15, 2005. Go and experience it for yourself. I think you'll be glad you did.